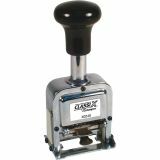 Xstamper Self-inking Auto Numbering Machine - Self-inking automatic number stamp operates consecutive, duplicates, triplicate or repeat. Tough metal frame withstands even the most demanding workload. Plastic handle is comfortable and durable. Number stamp features seven-action automatic advance, Type size 1 and black ink.